In the last few years, the Siamese Ponds Wilderness Area has become increasingly popular with cross country skiers. 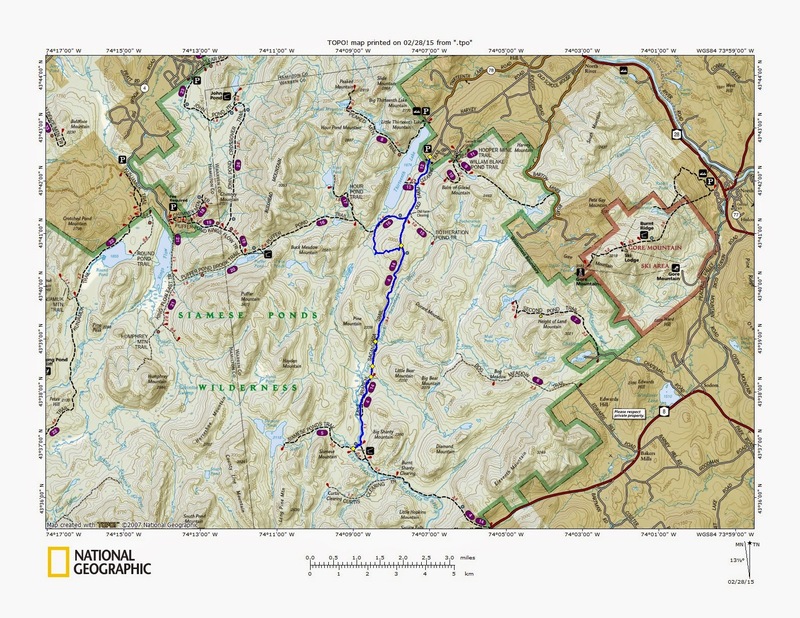 This is due in part to the network of trails that includes the Botheration Loop and the Raymond Brook Ski Trail. These trails were designed as ski trails and were well planned. Skiers obviously appreciate the network as can be witnessed by the skier traffic in the area. Other trails have been around for years as old roads turned into trails. The East Branch Sacandaga Trail in the Siamese Ponds Wilderness has been around for over a hundred years. A jeep road is shown on the 1885 topo map of the area. This trail now runs from the Old Farm Road near Thirteenth Lake and goes 11 miles to Route 8 just south of Eleventh Mountain. It follows the East Branch Sacandaga River until the last mile and a half or so when it leaves the river to make its way to Route 8. Last night I was contemplating where to ski today. I wanted a fairly long ski but I didn't want to break trail in 2 feet of powder and I didn't want to be on a trail that was hard packed from a lot of skier traffic. The East Branch Sacandaga Trail seemed like a good bet. It doesn't get a lot of traffic, but there was a good chance it was broken out since its been a couple weeks since the last big snow. 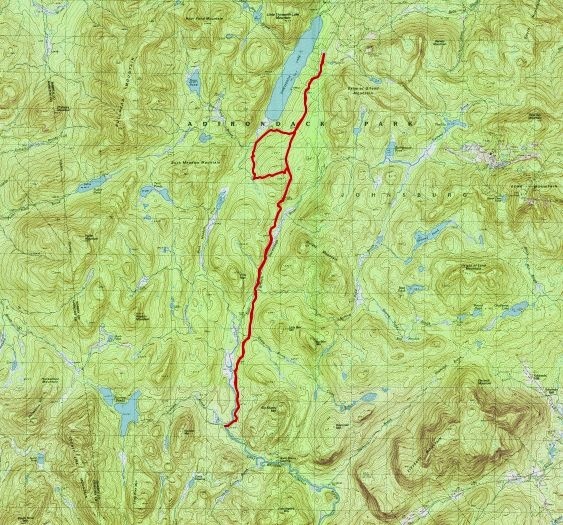 I parked at the Old Farm winter trailhead with hopes of skiing 7 miles to the Sacandaga lean-to and then return. As expected, the first 1.1 miles was hard packed snow until I got past the SW portion of the Botheration Loop, but even this snow wasn't bad for skiing. As I got past the Puffer Pond Trail at 1.2 miles I found the E. Branch Sacandaga trail had been skied on recently by 2 skiers. Perfect; the trail was broken yet still soft snow. By going north to south I had more downhill on the way to the lean-to. After a slow climb to the 2.4 mile mark, the trail drops almost 300 feet over the next mile. I had good ski conditions, so this stretch did not present a problem, but it can be fast if the snow is firm. At the bottom of the downhill run, the trail comes alongside the river. At 4.5 miles the trail crosses the river on a bridge. My dog Rev was a little timid about crossing the bridge, but she followed me after I went across. Once across this bridge, the trail is quite level all the way to the lean-to. At 5.4 miles, there is a small bridge crossing over Cross Brook. Rev took the lead this time. At 7.1 miles we reached the Sacandaga lean-to. It is located at a 90 degree bend in the river. A large suspension bridge provides access to the other side for those wishing to continue on to Siamese Ponds. I crossed the bridge just to take some pictures then came back. Rev actually came out on the bridge with me. After a cold -15 degree start to the day, I could tell that it was beginning to warm up nicely. I sat in the lean-to and had some food and drink. Rev had some treats. The lean-to is starting to show its age, but is in no structural danger at present. I first saw the lean-to 31 years ago, so its doing OK. It sits close to the river, so if and when it needs work, I'm sure it will be moved further inland, as it current practice. On the way back, I took a detour to follow some ski tracks and orange ribbons (see loop below on the map). The tracks followed what perhaps at one time was a path or an old tote road. After going up and over a small bump, I followed the tracks down the other side. At the bottom, the tracks turned south and the orange ribbons headed north. I wanted to go north, so I broke trail for a half mile before connecting with the Puffer Pond Trail. The woods were open, but the snow was deep, so breaking trail was slow. Once on the Puffer Trail, I was quick in getting back to the car. Rev and I didn't see a person all day, although 6 other cars were in the parking lot when I left. It looks like all were on the Botheration Loop, or at Hour Pond.